You’re going to love your new eyewear! We have a unique and fashionable selection of eyewear including lines for the designers listed below, in addition to many others. We pride ourselves in providing our patients with unique eyewear that speak to our patients’ personality, as well as more conservative styles that patients may prefer. Whether your style is bright and bold or more conservative, we promise that our frames are of higher quality than you will find anywhere else! We think that updating your frames yearly should be an option, not a requirement because of low quality frames that don’t hold up! Therefore, we offer frames that are of the highest quality and will stand the test of time. We try to fill every niche that our patients may demand, including pediatric frame lines from 2 months to 12 years, frame lines dedicated to our tween and teen demographics, frame lines for petite faces, frame lines for larger faces, and everything in between! Quality frames deserve quality lenses! 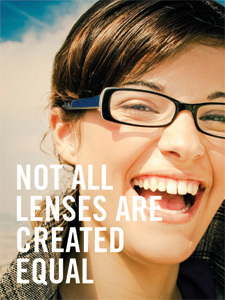 Ocean Eye knows that not all lenses are created equal, so we carry only the highest quality lenses in order to ensure our patients will love their new eyewear for years to come! We offer the thinnest and lightest lenses available, as well as the most impact resistant lenses on the market. All of the lenses we offer include a Scratch Coating and a Non-Glare Coating that improves glare from computer screens and while driving at night. 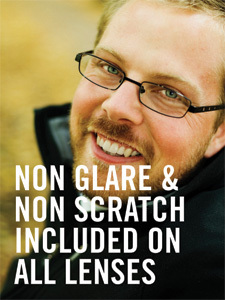 All lenses are guaranteed against scratches, or we’ll gladly remake them! We also offer Transitions lenses, which may be more convenient for some patients than prescription sunglasses. Our highly trained optical staff will happily discuss all of your eyewear options with you during your visit and ensure that your glasses are adjusted and performing properly. UV radiation can affect your eyes considerably. It has been linked to various eye diseases such as cataracts and macular degeneration, among others. We have a large selection of sunglasses to protect your eyes from the sun’s harmful UV rays as well as give you a fashionable accessory. We’re seeing more and more of our patients turning to high quality sunglasses that meet their visual demands when outside. 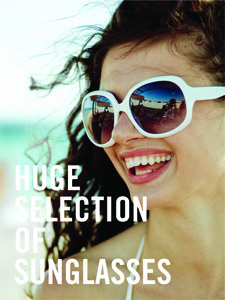 We specialize in Ray-Ban, Nike, Kaenon, Wiley X, Michael Kors, Vogue, Cole Haan, among others.